Home › Publications › Commentary › Hope on the horizon? People can find themselves struggling with poverty due to mental health concerns or addictions. Poverty is extremely stressful and can exacerbate these as well. High meth use in Manitoba is impacting crime rates (see “Meth is a Symptom, Poverty is the Crisis”. 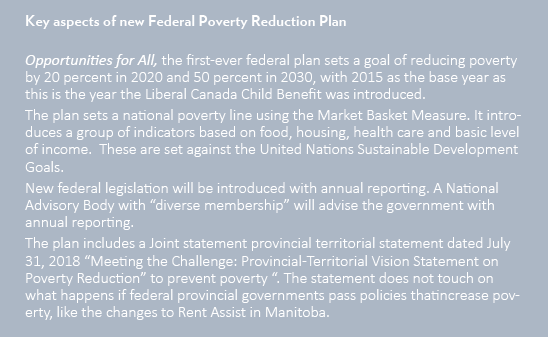 To combat the negative impacts of meth use, government poverty plans must deal with the root causes of addictions and mental health concerns via comprehensive poverty reduction plans including social housing and inadequate social assistance rates. A lack of treatment facilities and no cost community supports are only exacerbating the crisis. MPHM recommends an increase in provincial mental health spending by 40 percent over three years. Additional federal funding for the opioid crisis will help, but should be no substitute for provincial investments.